MeniQ - treatment of Meniere. MeniQ pressure pulsator comes complete with pulsator, user manual, hose, handle and ear seals in 3 different sizes. Treatment with MeniQ can be started directly, MeniQ have IPC (Individual Pressure Control) and instead of a ventilation tube in the ear, pressure pulses can easily be adjusted individually. 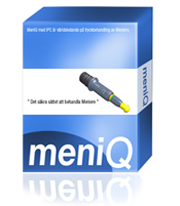 Treatment with MeniQ is easy to performe and provide security. 25 year warranty.